5th Trimester dilemma: "What if I can't leave work to take my baby to the doctor?" Chicest infant accessory: Vaccine bandages! See this adorable baby boy? 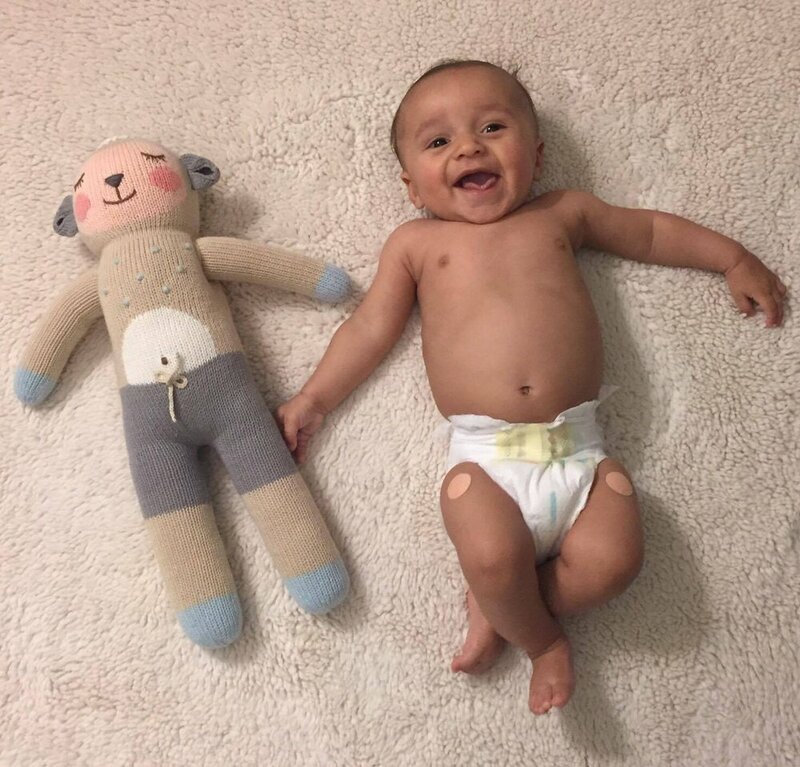 His name is Biden, and those bandages on his delicious thighs are from his four-month vaccines—which his mom Teri, an attorney, got for him with no problem at all because she's still on her maternity leave. Teri knows she's lucky to have a longer leave than most U.S. women, and studies show that Biden's health will benefit: Babies whose mothers return to work before 12 weeks are less likely to have gotten all of their immunizations by 18 months old. Another international study showed that every additional month of paid leave can reduce infant mortality by 13%. Infant mortality, as in death. I know I struggled logistically whenever I had to leave my desk job for the two-plus hours required for a well-baby checkup. And when my little guy was sick or in pain? I struggled emotionally, too. Still, at least I had the flexibility (barely) to make up the hours at night or ask a colleague to pinch hit for me. But what if, like so many moms, you couldn't lose a shift without losing rent money or your health insurance? Choose a convenient practice: Location is important but pay special attention to the hours, too. "Make sure your doctor is available on the days when you are, and find out what kind of coverage the practice has for weekends and nights," says Dr. Spengler. "A lot of my patients will know that they have a specific day off each week. Others may find that their hours are less predictable, and they can certainly see a colleague of mine. But those first few appointments are pretty bonding. And switching can feel frustrating if that's not something they've planned for." Don't space out vaccines: "There's no evidence for spacing out vaccines, and dragging them out over more appointments just increases the risk that you might miss one," says Dr. Spengler. And in fact, she notes, the first set of shots can be given as early as six weeks if you're returning to work and it's more convenient for you to accelerate the vaccination schedule (but do check with your own doctor about his/her preferences). This is huge info for anyone going back between weeks six and eight! Send in backup: "There's nothing wrong with sending a family member or babysitter in your place. That's preferable to missing the appointment," says Dr. Spengler, who also suggests that you can then call into the appointment to speak to the doctor directly. Ask your doc to give you written notes: "That's a big push in medicine, to be more sensitive to various levels of health literacy and to communicate more clearly," says Dr. S. "So written information can help parents better understand instructions." That's especially helpful if you have a non-primary parent or caregiver attending the appointment in your stead. Don't be embarrassed: If you need to cancel or miss an appointment, don't let that be the start of a slippery slope of awkwardness that makes it even harder to come in the next time. "The last thing we want as pediatricians is for our patients to feel judged by us," says Dr. Spengler. "Many pediatricians are parents themselves and are very intimately aware of the struggles of making it to multiple appointments during what may be both the happiest and most stressful time of life." Most of all, be open with your doctor: "It's always, always better to share more information about your struggles than not," says Dr. Spengler. "It makes it easier for your doctor to help, particularly in those early months. Giving vaccines is our superpower, and most pediatricians will bend over backwards to make sure you're getting them."